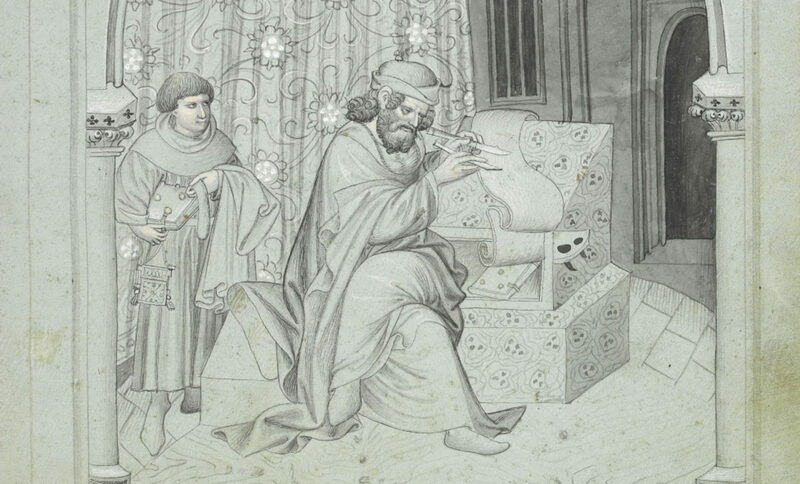 A few years ago, the Medieval Institute launched a new scholarly initiative. Designed to highlight the wealth of scholarly information here at Notre Dame while increasing scholarly community and cross-communication across disciplines and ranks, the Medieval Institute Working Groups were established as a means of creating such an academic crossroad. One of these groups, Religion and Pluralism in the Medieval Mediterranean, sought to push against the popular image of the Middle Ages as a uniquely Western European Catholic phenomenon. The organizers, Dr. Thomas Burman (Director, MedievaI Institute), Dr. Gabriel Reynolds (Professor, Theology) and Andrea Castonguay (Ph.D. Candidate, History), believed that by shifting the geographical parameters from Northwest Europe to the Mediterranean basin and opening up the confessional borders of scholarly investigation that had previously segregated the Middle Ages into self-contained Catholic, Eastern Orthodox, Jewish, and Muslim spheres, the Working Group would bring new perspectives to the idea of the Middle Ages and facilitate an interdisciplinary approach to the period. If a topic was somehow tied to the peoples, cultures, and civilizations active in the Mediterranean at some point during the Middle Ages, the Religion and Pluralism Working Group judged the topic fair game for discussion, inquiry, and exploration. While this rubric for a field of critical inquiry might be seen by some as generous to a fault, its breadth is actually the Working Group’s greatest strength. By casting a wide net, the Religion and Pluralism Working Group attracted a diverse group of members and speakers, most of whom would not necessarily interact with one another in an academic setting outside of a social hour. During our first year in 2017-2018, we hosted 8 sessions where the topics of discussion and the presenters themselves reflected the group’s diverse make-up. The inaugural session was led by Dr. Jeremy Pearson (Bryant University), then a postdoctoral fellow at the Medieval Institute, who presented an article on William of Tyre (d. 1186), an archbishop and Dominican friar of European origin born in the Crusader kingdoms and privy to a unique perspective on the interplay between European Christians, Levantine Christians, and their respective relationship to the life of the Prophet Muhammad. Although not by design but by happenstance, the Working Group continued to focus on Christians in the the Middle East and how they responded to Islam during Fall 2017 by reading Michael Penn’s Envisioning Islam: Syriac Christians and the Early Muslim World (UPenn, 2015) and hosting Dr. Jack Tannous (Princeton University) for a lecture and discussion on Syriac Christian sources and their importance for understanding the early centuries of Islam, the establishment of the Umayyad (661-749/750) and Abbasid caliphates (749/750-1258). 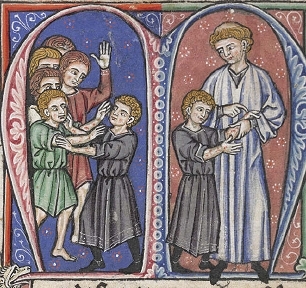 William of Tyre discovers Baldwin IV’s leprosy, from Histoire d’Outremer, British Library, MS Yates Thompson 12, f. 152v, mid 13th century. Image Source: Wikimedia . During our Spring 2018 sessions, our attention turned to other parts and peoples of the Mediterranean and other types of scholarship. Whereas our Fall 2017 sessions focused on using religious texts to understand historical events, our Spring sessions turned to the ways in which different types of physical evidence, from archeological records, material culture, personal journals, could tell us about the medieval past. Dr. Sarah Davis-Secord (University of New Mexico) joined us for a discussion of her book, Where Three Worlds Meet: Sicily in the Early Medieval Mediterranean (Cornell UP, 2017) and spoke about the pros and cons of reconstructing centuries of history from physical objects in the absence of written records. Eve Wolynes (Ph.D. Candidate, History) presented a chapter from her dissertation on Venetian and Pisian merchant families and the various differences between Italian merchant families and commercial practices during the Late Middle Ages that her source material revealed over the course of her investigation. Last but not least, the three co-organizers of the Religion and Pluralism Working Group, Tom Burman, Gabriel Reynolds, and Andrea Castonguay, all took turns presenting various works-in-progress to the group. Gabriel Reynolds presented book chapters on sinners and sin in Islam from his forthcoming book, Allah: A Portrait of God in the Qur’an, while Andrea Castonguay presented a dissertation chapter on Muslim dynasties and competing Islamic sects in early medieval Morocco. Tom Burman closed the 2017-2018 year by presenting with Dr. Nuria Martínez de Castilla (École Pratique des Hautes Études, Paris) and Dr. Pearson the fruits of their collaborative project on the purported correspondence between Byzantine Emperor Leo III (r. 717-741 ) and the Umayyad caliph ‘Umar II (r. 717-720) and its dissemination in Latin, Armenian, Arabic and Aljamiado (medieval & early modern Spanish languages written in Arabic script) literature during the Middle Ages. 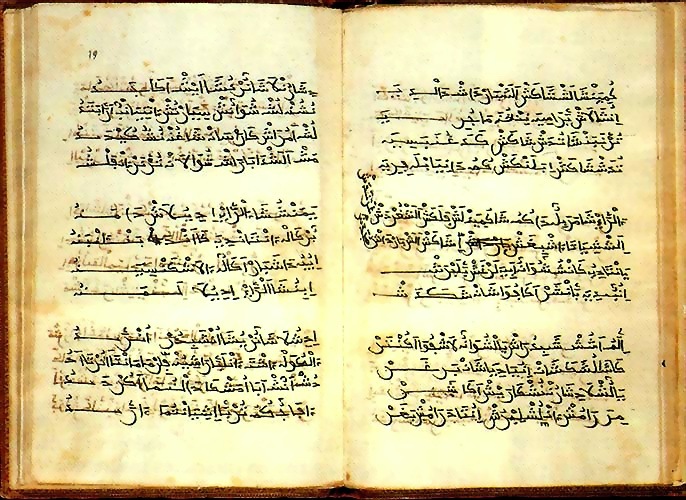 Poema de Yuçuf, c. late 14th century. Manuscript B; Author and copyist unknown. Image source: Wikimedia. As the Working Group moved into its second year, its members sought to keep up the momentum while upholding the group’s commitment to rethinking the traditional academic boundaries of the Middle Ages. Noticing the lack of sessions devoted to Byzantine scholars and studies during the previous year, the members of the Working Group rectified that by asking the resident Byzantine postdoctoral fellows, Dr. Lee Mordechai and Dr. Demetrios Harper, for their recommendations. As a result, the group read Phil Booth’s Crisis of Empire: Doctrine and Dissent At the End of Late Antiquity (UCalifornia, 2017), which explored how monasticism, initially a very vocal way of rejecting centralized power and empire, became an important component of both the Eastern Orthodox Church and the Byzantine Empire during the 6th and 7th centuries. In addition, Dr. Paul Blowers (Milligan College) was invited to speak about the interplay between the pre-Christian Classical world and the Christian Byzantine world in theatrical literature. Issues related to the Byzantine world and its relationship with the former Roman Empire were also discussed during a presentation by Dr. Ralf Bockmann (German Archaeological Institute Rome; Institute for Advanced Studies, Princeton) by way of changes to church structures and saint veneration in Christian North Africa during the transition from the Vandal (435-534) to the Byzantine (mid 6th- mid 7th century) period. In a similar vein, the organizers sought to diversify the Working Group’s membership by reaching out to new members of the wider Notre Dame and St. Mary’s community and asking them to present their research. Dr. Hussein Abdelsater, a new member of both the Arabic and Middle Eastern Studies Department and Medieval Institute Faculty Fellows at Notre Dame, presented a paper on the miracle of the splitting of the Moon and the ways in which it was discussed in Qur’anic exegesis. Dr. Jessalynn Bird (Humanistic Studies, St Mary’s) presented early work on Jacques de Vitry (1180-1240) and and Oliver of Paderborn (fl. 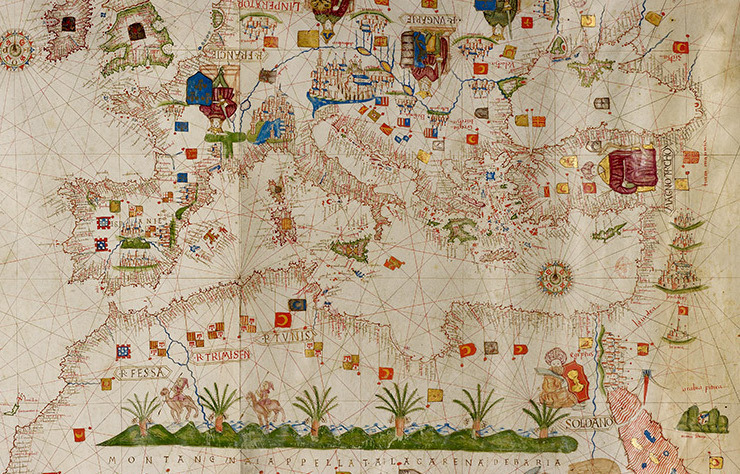 1196-1227) as part of a new book project on Mediterranean geography in the writings of Western Europeans. Dr. Robin Jensen (Patrick O’Brien Professor of Theology) gave a presentation on the tension between early Christians, their adherence to the commandment to have no false idols, and the presence of Classical deities and statuary in the Late Antique Mediterranean landscape. Falnameh: The Book of Omens, 16th Century Persian manuscript; Artist unknown. Image source: Source: US Library of Congress. Moving outside of the South Bend community, Dr. Mark Swanson (Lutheran School of Theology, Chicago) was invited to speak about the ways in which Copts in Mamluk Egypt read various Arabic works such as the writing of Moses Maimonides (c. 1135-1204) and the Pentateuch of Saadia Gaon (c. 882 -942) and incorporated their ideas into Copic liturgy and liturgical writings. This presentation along with Dr. Swanson’s generous show-and-tell of publised Coptic primary sources was especially interesting to several upper year Theology Ph.D. Candidates working on Near Eastern Christian communities, who were pleased to learn more about the various resources available for the High and Late Middle Ages. 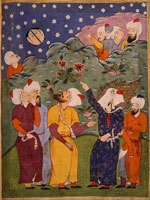 From its inception, the goal of the Religion and Pluralism Working Group was to bust down the various walls that silo academics and scholars into a specific discipline while reminding others–ourselves included–that the Middle Ages was a long historical period encompassing many different civilizations, peoples, faiths, and geographies, and that we need that multiplicity of specialists in order to understand this period in history. There is no such thing as a medievalist who can act as the sole representative of the discipline, nor can they bear the discipline’s weight all by themselves. Rather, there are medievalists working in concert with and parallel to one another and the strength of the discipline rests upon their abilities to connect with one another, share information, and challenge their own understanding of the Middle Ages through repeated exposure to the different flavors and facets of the period. In order to best represent and reflect the multi-faceted nature of the Middle Ages and the diversity of contemporary medievalists, an interdisciplinary approach to understanding the period is in order. The Religion and Pluralism in the Medieval Mediterranean Working Group provides such a space, and it is our intention to keep this momentum going during the 2019-2020 year and beyond. Stay tuned to MI News and Events for details and future meetings! Most of us in the English-speaking world have read Beowulf, in translation and in high school. It is generally taught as an ancient text with insights into Anglo-Saxon culture, whispering from our distant past. But can these whispers speak meaningfully to us today, aside from mining historical gems from the text? Beowulf is a medieval poem about heroes and monsters. But it also a poem cautioning against the destructive forces of violence and greed, the very same combination of forces which most trouble the world today. For those who read the text in the original language, Beowulf is a playful, at times suspenseful, poem which masks its monsters in ambiguous language and draws verbal parallels between the heroic protagonists and their monstrous antagonists in ways that challenge a reader’s assumptions. And, of course, it was performed! Are there ways of performing Beowulf, which speak both to then and now? This is the mission behind Grendelkin. “Grendelkin” at Notre Dame, produced by Richard Fahey and sponsored by the Medieval Institute. 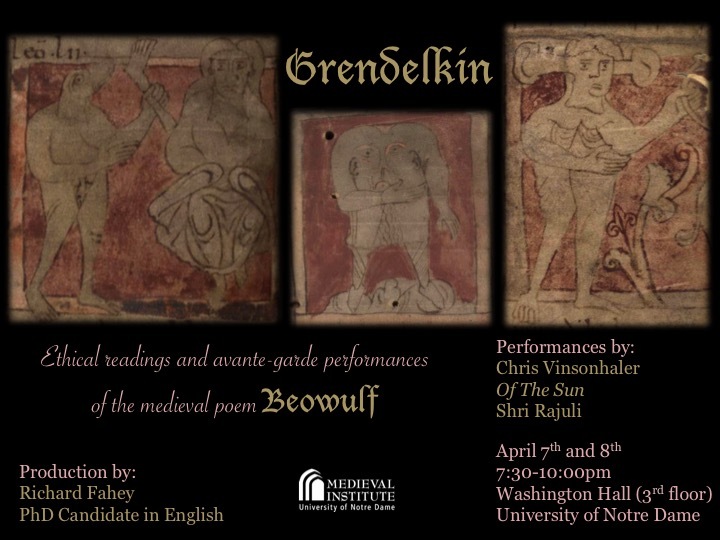 Grendelkin is an upcoming two day production sponsored by Notre Dame’s Medieval Institute, which seeks to highlight the ethical concerns expressed in Beowulf through professional storytelling and avant-garde performance. Grendelkin interrogates the function of reciprocal and sanctioned violence within the text and challenges tribalism and the warrior ethos of the poem, while keeping a modern audience and their contemporary concerns in focus. Cost: The event is free (no ticket charge) and open to the public. Tickets will be given at the door and programs will be available at the venue. An award-winning performance, Beowulf: A Poem for Our Time, will roar to life on Friday, April 7, in a program that is free and open to the public. This performance frames her version of Beowulf in both an Anglo-Saxon historical context and in conversation with contemporary current events and cultural knowledge. The general public is invited, and high school classes are expressly invited. However, because of the sophisticated and violent content, the performance is recommended for adults and young adults only. Awarded a fellowship funded by the National Endowment for the Arts, Chris Vinsonhaler is an internationally touring artist who also serves as a professor with the City University of New York. “Vinsonhaler’s Beowulf bristles with an energy and enthusiasm that is both captivating and infectious,” said Andy Orchard, Professor of Anglo-Saxon at Oxford University. Now fifteen years into the project, Vinsonhaler has completed a Ph.D. in pursuit of the project. And she believes the secret of the poem is revealed through performance. Chris Vinsonhaler is currently working to revise her translation and has a website designed to help students of Beowulf access the “bones” of the language in order to better understand the poem and its performed context. This first act will be comprised of three recitations of short episodes from Beowulf in the original Old English language and accompanied by the bardic harp. The Lay of Scyld “Terror and Tribute” is the first of the three lays, and the shortest. Scyld’s Lay establishes a paradigm for heroic kingship in the poem. It tells of the heroic deeds of Scyld Sceffing, as he terrorizes the surrounding nations and exacts his tribute from them. The Lay of Sigemund “Murder and Plunder” is the second lay in the series, and tells of the heroic deeds of Sigemund (from the Vǫlsunga saga and associated literature), especially his slaying of a mighty dragon and plundering his treasure. This episode foreshadows the later dragon episode and describes Sigemund in terms similar to the monsters in the poem. Grendel’s Approach “Becoming a Monster” is the last section of Beowulf, and describes how Grendel comes from the dark night, through the swamps and into the hall to feast on the men there. Grendel’s Approach isolates the terrifying moments in which the monster finally arrives and confronts both characters and readers for the first time in the narrative. Richard Fahey is a PhD candidate in the English Department at the University of Notre Dame where his research interests include monstrosity, syncretism, rhetoric and intertextuality in Old English, Old Norse literature and Anglo-Latin literature. In addition to producing Grendelkin, Richard is currently working on his dissertation “Enigmatic Æglacan: Riddling the Beowulf-monsters” which brings the Exeter Book riddles into conversation with Beowulf through lexicographical and stylistic analysis. Richard is also an editor and contributor to Notre Dame’s medievalist blog The Chequered Board and for the affiliate Old English Poetry translation and recitation project. Boston sound artist Tom ‘Totem’ Fahey started working with sound and becoming invested in music as far back as elementary school. Forming several bands in his youth, he eventually found himself at Massachusetts College of Art and Design in the S.I.M. program [Studio for Interrelated Media]. Here he took to avant-garde compositions and developed his ear and vision for studio and live event production. Since then Tom has performed in numerous projects ranging from folk music to experimental noise to black metal, and has done various sound installations and sound design work for local artists and musicians. Tom has worked also as art director for Boston’s annual New Year’s art festival First Night from 2011-2015. (((::OF THE SUN::))) was started in June 2010 by Tom Fahey and Adam Blake from the ashes of an experimental improvisational sound project called Fractillian, which performed around the Boston area from 2007- 2010. Having taken on the visual projection art of Andrew Goldman, they performed live for the first time in November 2010. 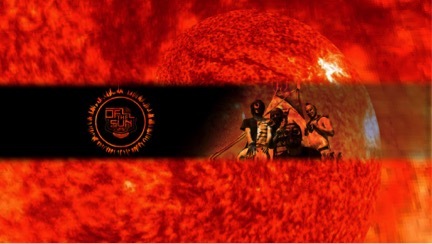 (((::OF THE SUN::))) is influenced by Norwegian Black Metal and avant-garde Drone music. 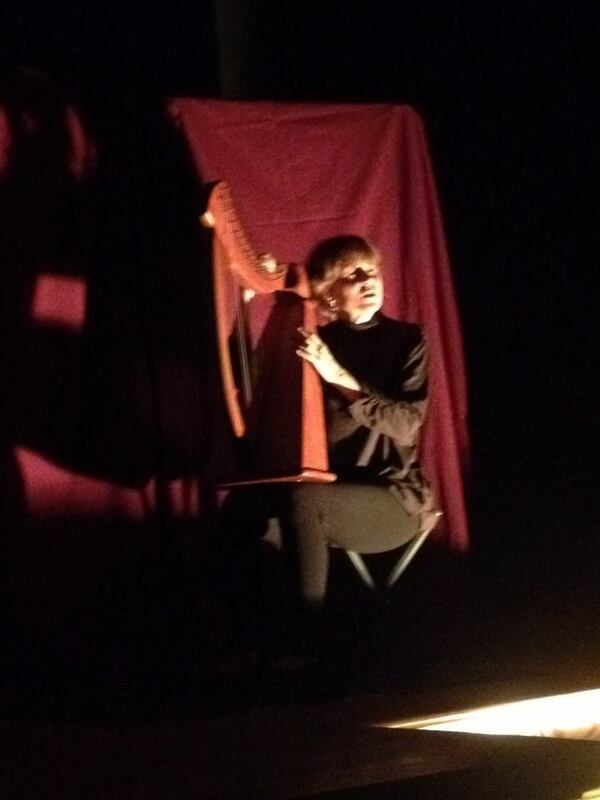 Boston sound artists “❨❨❨:: Of The Sun ::❩❩❩ performing two acts in Grendelkin. Shortly after forming, the vocal and performative force of CJ Carr joined Fahey and Blake and they performed as a trio for the first time in February of 2011. 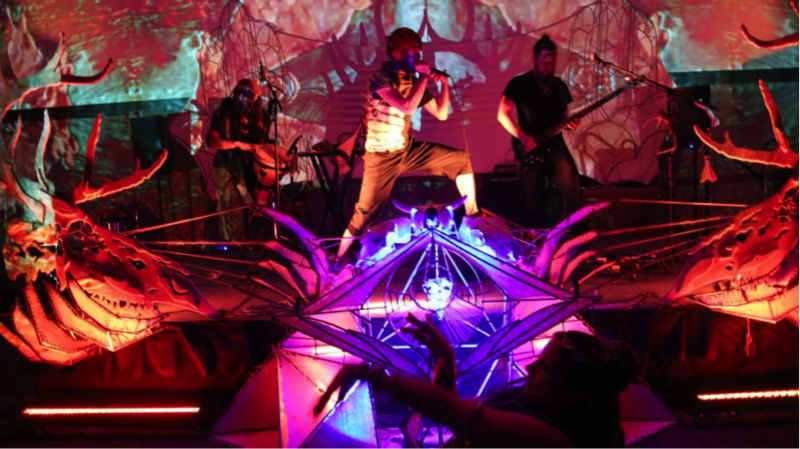 In 2012 (((::OF THE SUN::)) started performing with acro-yoga artists Adam Giangregorio and Nicole Leland, which became a regular part of the experience, and in 2015 joined forces with the movement artist Wisty, performing with Grendelkin. Wisty Andres, originally from Tokyo, Japan, started dancing in Columbus, OH at age 7. She has trained in classical ballet, modern, jazz, latin dancing, stilting, and tumbling. She is an alumna of Interlochen Arts Academy where she performed Les Patineurs, Sleeping Beauty, Viva Vivaldi, Serenade, and other classical and contemporary works. Andres holds an AA in Dance from New World School of the Arts College in Miami, FL. 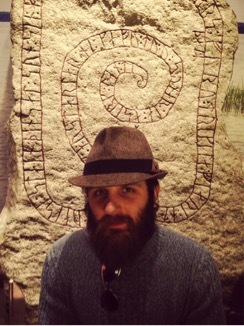 Wisty Andres, Boston performing artist in ❨❨❨:: Of The Sun ::❩❩❩ and Grendelkin. Andres moved to Boston in June 2013 and performed solo work (Satta under Vatten) at the Boston Contemporary Dance Festival 2013 and has also been involved in several projects with 1000virtuesdance since July 2013. Andres previously worked with Penumbra:Movement as a guest choreographer at the 2014 Dance for World Community Festival and a guest artist in the 2014 Spring aMaSSit concert. Andres is currently dancing with Urbanity Dance Underground Company, and also a dancer and Resident Choreographer for Penumbra:Movement. She has been presenting works all over the Greater Boston Area as an independent choreographer in various venues, including NACHMO Boston 2014 and 2015, Third Life Studios Choreographer Series, Urbanity NEXT showcases, and Green Street Studios. The second act, Sceadugenga is inspired by Grendel’s haunting approach to Heorot, and the psychology and mythology surrounding a monster. This piece incorporates the Old English language and raises some of the questions discussed in the current scholarship. ❨❨❨:: Of The Sun ::❩❩❩ performing with Shri Rajuli at “First Night” Boston, TRIBE VIBE (12/31/14). For those interested in previewing a performance, there is video footage corresponding with the above image of❨❨❨:: Of The Sun ::❩❩❩ performing their song “Light” at Boston’s “First Night” in an event called Tribe Vibe. The third act, Umberhulk, explores the parallelisms between heroes and monsters, such as is found in descriptions of Beowulf and Grendel during their epic battle in the hall. Rajuli has performed and taught for over ten years. She has studied and collaborated with dance professionals all across America. Rajuli is an active movement and installation artist from Boston, and received BFA with Distinction from the Studio for Interrelated Media from the Massachusetts College of Art and Design and is a Rachel Brice 8 Elements Initiate. Her movement art incorporates elements of Indian folk, Ballet, Jazz, African, Haitian, Flamenco, Gothic, Butoh and Modern and modern dance style. Movement artist Shri Rajuli. Rajuli will be performing her piece “Wrecend” and embodying the character of Grendel’s mother. 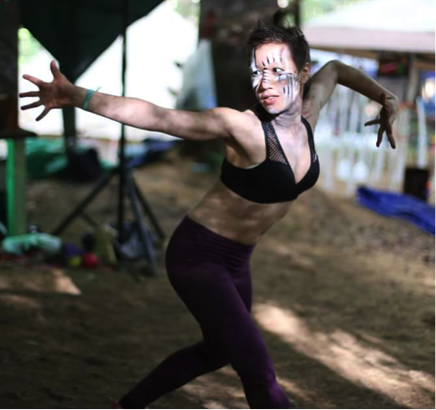 Rajuli has produced movement art shows in the past, such as her recent event Immaculate Portal (7/22/15), which celebrates the experience and journey of motherhood through interpretive dance. Links to additional performances may be found on her website. Rajuli will be performing the final act of the evening, her piece titled Wrecend, which explore the experience of maternal loss and grief from the perspective of Grendel’s mother. After the final act, there will be a brief panel discussion of performers in Grendelkin, discussing their art in relation and conversation with some trends in scholarship. At this time, audience feedback and questions are welcomed! Whether you are a medievalist, an artist, an educator or an enthusiast, we hope you will join us for Grendelkin! Special thanks to Chris Abram, John Van Engen, Thomas Burman, Megan Hall, Peter Holland, Sara Maurer, the English Graduate School, and especially the Medieval Institute for their support of this project. Digitized Manuscript: British Library, Cotton Vitellius A.xv (Nowell Codex).